Bring out the flavors of onions and center cut bacon in this savory slow-cooker smothered chicken recipe. 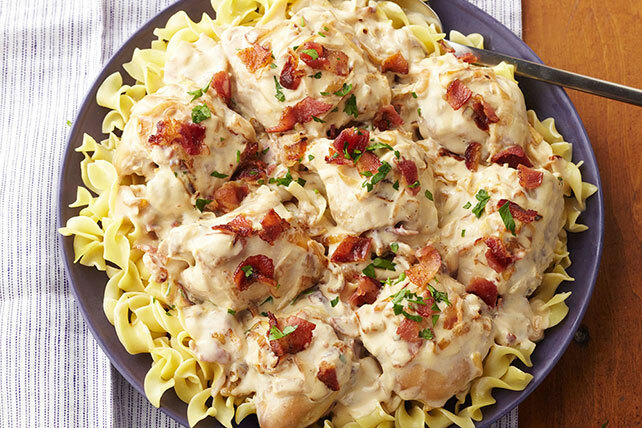 This Slow-Cooker Smothered Chicken with Bacon is great on top of tasty egg noodles. Add chicken to slow cooker; cover with onion mixture. Cook on LOW 4 to 5 hours (or on HIGH 2 to 3 hours). About 15 min. before ready to serve, cook noodles as directed on package, omitting salt. Drain noodles; place on platter. Top with chicken, reserving onion mixture in slow cooker. Mix cream cheese spread, milk and garlic powder until blended. Add to onion mixture; mix well. Spoon over chicken; top with parsley and remaining bacon.